Located only one hour from Ljubljana (you will be hearing a lot of that from me! 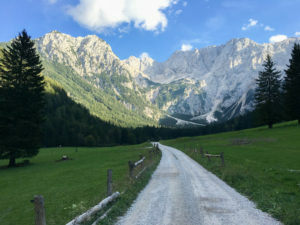 ), Jezersko (literally meaning “Lake Region”) is a magical place filled with dozens of hiking trails, including a set which conveniently convert to cross-country ski treks in the snowy winter months. Jezersko offers stunning vistas of majestic mountains nestled in a vast voluptuous valley. I would recommend using the restaurant Gostisce On Plansarskem Jezeru as your home base and treating yourself to a delicious traditional Slovene meal complete with the joyful clatter of locals laughing and clinking glasses either before or after venturing out on your journey. Heading out from this restaurant, you could do an easy two-hour loop in the Ravenska Kočna Valley past the still lake of Plansarskem Jezeru, along Jezernica stream, and through cow pastures, while enjoying views of both sumptuously green mountainscapes and the stunningly stark north face of the Kamnik-Savinka Alps and their glaciers jutting out into the sky. You will also see the highest peak of Mt. Grintovec. If you want to venture further, the clearly marked loop around the meadow lands leads to a central hub of harder hiking through forested trails and up the mountains for fantastic views. You can even hike up to the glaciers. These hikes are not for the faint of heart and require some serious physical fitness. If you want to cut straight to the serious stuff there is ample parking right at the trail heads for the harder hikes. Aside from the spectacular beauty, one of the greatest parts about hiking in this area, in my opinion, is the fact that it does not feel touristy in the least (ironic coming from me, I know). 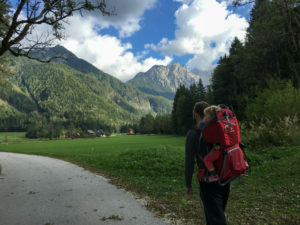 Unlike visits to Bled or Bohinj and the surrounding areas, you do not encounter crowds or tourists. 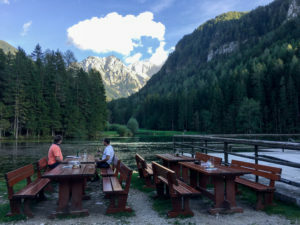 This area is filled with mostly local nature lovers out to enjoy some of Slovenia’s finest.